One of my colleagues at school is a big proponent of teachers' rights and believes that the teachers' unions are crucial for good public schools. This is an idea that has gotten a lot of flak lately, but I agree with him. However, there is one point that we often discuss and always disagree. Advocacy. He is a classroom teacher and thinks that his good teaching stands on its own and that he doesn't need to prove how hard he works by talking about what goes on in his classroom. He doesn't know what I have gone through as a librarian over the last twenty years, and how important it has been to broadcast about what goes on in a school library. I explain to him that it is vital that librarians shout about all the wonderful activities happening in their library. I do just that with this blog, the library website, twitter, email blasts, discussions with my principal, notices in the daily memo and articles in the school monthly newsletter. Since I became a librarian, I have used whatever media was available to advertise the library. I had to. Often, my library position was on the chopping block. At those pesky principal meetings I wanted my principal to say that their librarian was an integral part of the school program. My advocacy has not always saved my position. Over my 12 years as an elementary librarian, I spent four of them as half time librarian and half time literacy teacher for a specific group of children. I can multi-task, but being a librarian is a huge job, and it was difficult to do great work only working part time in each position. When I had the opportunity to move to a 7th -12th school configuration, I jumped at the chance. I figured that my position was safe. After two years, the district decided that all high schools could function with one librarian no matter how big the school. My school had 1500 students, and we did lots of teaching in the library. There is no way that one person could teach and run the library the way that we did it with two of us. Then Katrina happened. I chose to find a new library. I left the Orleans Parish schools and found a job in Jefferson Parish at Patrick Taylor Sci Tech Academy. This is my seventh year at Patrick Taylor, and I have worked under two principals. I feel very lucky that both of them have been extremely supportive of the program that I have created in the library. I also want to say that both of these principals were former math teachers and probably did not use the libraries very often in the schools were they taught. 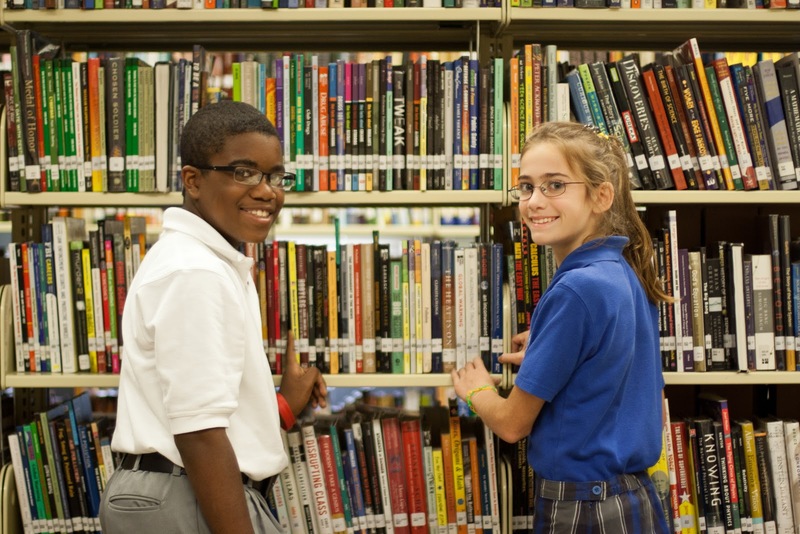 They watched how I brought students into the library, got students reading and helped provide a foundation for teaching 21st century skills and couldn't help but see how the library has grown to be the hub of the school. I continue to be my own advocate. I also encourage other librarians to do the same. Why do you need to talk up your program? If you don't do it, then nobody else will. I make sure that teachers and staff know what great things are happening in the library. Because of that, I will hear the secretary explain to prospective students about all the wonderful books that are on the library's shelves. When the school holds its annual open house for prospective students, I am always amazed at what the current students say about the library. It blows me away when they say, "if you need help with your research just ask Ms. Kahn because she knows where to find the best stuff." When visitors are toured around campus, the library is always a stop and described as one of the happening places on campus. The library at Patrick Taylor has an open door policy. Students and teachers are always welcome, but because of this inclusive spirit other wonderful things have come our way too. We have 3 to 4 author visits yearly either face to face or through Skype, the high school book group has been asked to participate in a number of events sponsored by YALSA and we have been able to win many grants because the library program is such a viable force in the school. There are lots of ways that you can be an advocate for your library. It could be digital or in print. You need to reach all stakeholders: students, parents, administrators and the community. Click here for a link to sign up for AASL's Advocacy Tip of the Day. You can find other advocacy resources from AASL by clicking right here. Libraries have not lost their importance in the digital age; they just need to be fine-tuned to meet the needs of the learners. So think about you can do to be an advocate for your library, because your advocacy can affect all libraries. It is not about keeping your job; it is about providing a necessary service for the education of the students who attend your school. I hope you don't mind me quoting your post in my little blog here in Australia. So much of what you have said resonates with me. We are fighting to keep our precious positions as Teacher Librarians here in NSW and then I hear of colleagues who hinder children with reading!! !